HARTFORD -- Last year, Gov. Dannel P. Malloy leveraged the state's historic multibillion-dollar deficit to force his will on majority Democrats in the General Assembly, who raised taxes to record levels and cut $70 million in spending. State employee unions, after months of pressure and the threat of thousands of layoffs, finally agreed to short- and long-term concessions, helping erase the $3.3 billion deficit. In his second legislative session, however, Malloy has discovered that lawmakers often want to stamp their own imprint on bills. The Type A, "get-it-done" governor is learning the art of compromise. In February, Malloy submitted legislation that would not only allow Sunday retail sales of alcohol for the first time but attacked the price-support system for wine and liquor that assures package store profits. After a public hearing that packed the Legislative Office Building, then the bargaining and redrafting processes when the bill finally hit the House and Senate floors, the threat on prices was no longer in it. In reaction, Malloy vowed to tackle the monopolistic prices next year after a task force -- a traditional legislative way to avoid decisive action -- reports on the issue. Malloy's proposals to turn around the state's education system provoked a months-long pushback from lawmakers and teachers unions that -- until the very last week of the session -- threatened the governor's major goal for this year. His desire to quickly change the evaluation and tenure process was a particular challenge to teacher unions, particularly after his remark about teacher job security during his budget speech -- "basically the only thing you have to do is show up for four years" -- inflamed teachers across the state. During negotiations on the education reform legislation, teachers and lawmakers also were concerned about the possible privatization of troubled schools and the loss of collective-bargaining rights. Closed-door talks between Malloy's advisers and legislative leaders sometimes exploded, occasionally broke off, then inched closer to resolution as the General Assembly's midnight Wednesday deadline loomed. But the deal didn't close until Monday afternoon. The bill approved by the House and Senate bears a close resemblance to the legislation that was endorsed by the Education Committee in March. But there is enough there for lawmakers and Malloy alike to claim victory, with assurances for teachers that they will have enough power in writing evaluation standards and protecting union members. "I firmly believe that the measure that passed this chamber and is heading for the governor's desk, is a win-win," said Rep. Andrew M. Fleischmann, D-West Hartford, co-chairman of the Education Committee. "The key elements that the governor said he needed in a bill are there. The key elements that my leadership said it needed to see in the bill are there." State Education Commissioner Stefan Pryor gets a great deal of authority to ensure that troubled urban schools get effective turn-around models, Fleischmann said in an interview on the House floor in the waning hours of the session. "There will be a pilot for the new evaluations in the coming school year," he said. Kristen Record, a physics teacher in Stratford and the state's 2011 Teacher of the Year, praised the compromise legislation as good for education but admits she sees the governor differently now. "There was no need for the governor to kick off his `year of education reform' by being so adversarial to teachers," she said. "He made purposeful statements that were outright lies and damaged his relationship and credibility with teachers." Record said teachers deserve an apology. House Minority Leader Lawrence F. Cafero Jr., R-Norwalk, doesn't blame the governor for the final product of the education reforms. "Was it historic, bold and sweeping?" Cafero said. "No. That's not his fault. But I do give the governor credit for putting it on the table. Credit where it's due: We did a bipartisan education package." Malloy's Executive Order 1, issued within minutes of taking office last year, established that his administration would use Generally Accepted Accounting Procedures even when it means a higher deficit. That commitment sustained a setback in last week's budget adjustments, which borrowed from a 2009 surplus to pay for a $200 million-plus shortfall in the budget that ends June 30. Senate Minority Leader John McKinney, R-Fairfield, said last week that after the record tax hikes Malloy abandoned GAAP. "He said he was going to be honest and transparent and have GAAP accounting, but rather than cut spending, Governor Malloy gave up GAAP accounting," McKinney said. "There's no more honesty and transparency. He said we were going to fundamentally change the way we funded transportation and that every dollar that went to the Transportation Fund would stay in the Transportation Fund, but with a snap of the fingers, he raided $70 million from that Transportation Fund. That means our roads and bridges won't get fixed." 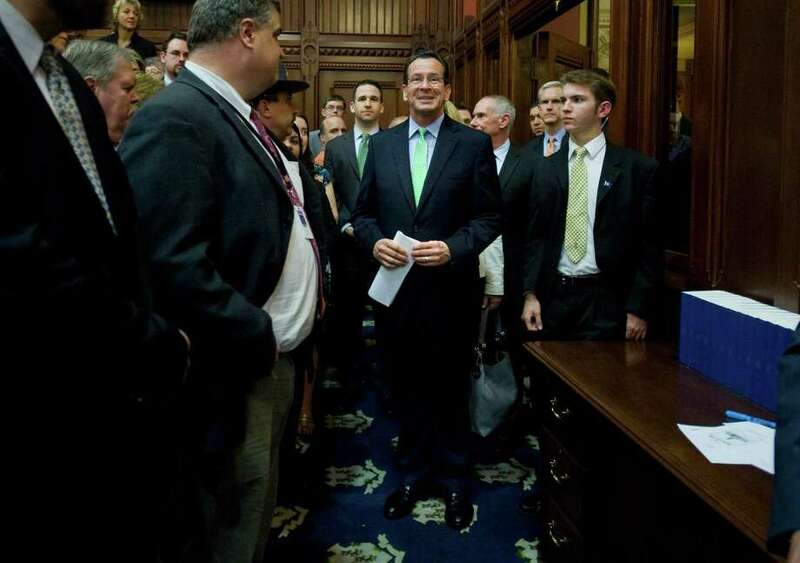 Malloy blamed the dire state of the budget last year on 16 years of Republican governors. "What we're not doing is what they did and that's to borrow money," Malloy told reporters on Friday. "That's what they did. They borrowed money to cover operating expenses when they didn't have the courage to cut those expenses. There is a truth that on the revenue side we missed by about a percent, it looks like, and we're using funds that are available to us to cover that. But what's the option?" The last time Republicans controlled even a single chamber of the General Assembly was a slim 19-17 edge in the Senate, in 1995 and 1996, the first term of then-Gov. John G. Rowland. Since then Rowland, a Republican, and GOP Gov. M. Jodi Rell made budget deals with majority Democrats in the Legislature, often over the protests -- and "no" votes -- of Republicans. "I think that what I have relearned -- I always knew it -- is that legislative bodies like to get as much work as they can get done at the last minute," Malloy said Friday. "As you know I like to get as much work done every minute, as possible," Malloy continued. "But when everything was said and done, we got on the administrative side or the executive side of government, everything we needed." Cafero disagreed. "Using Gov. Malloy's measurement as to how we did and by his own measurement, we had a very disappointing session," he said. Staff writer Linda Conner Lambeck contributed to this report.